FIELD OF THE INVENTION This invention relates to novel resin bonded cellulosic pulp products which have improved dry strength and wet strength and are degradable and their preparation. PRIOR ART Most conventional paper, when wet, will lose as much as 95% or more of the original dry tensile strength. To improve wet and/or dry strength of paper, it is known in the art to add certain water soluble resins and/or thermoplastic polymers to paper, usually during the papermaking process. There are many resins known in the art which impart a long lasting wet strength, and others which impart only temporary wet strength. The latter is discussed in U.S. Pat. 4,035,229 by Espy and discloses that temporary wet strength is useful for tissue and certain other applications. Temporary wet strength polymers are produced by reacting glyoxal with vinylamide polymers (U.S. Pat. 3,556,932, Coscia et al.) . These resins have a short shelf life when stored in aqueous solutions at concentrations useful in commercial papermaking processes. Espy (4,035,229) discloses the importance of high solids concentration and a long shelf life as being commercially useful and teaches the use of a resin based on a branched water-soluble polyalanine reacted with glyoxal. Resins that are commercially useful for imparting dry strength and a longer lasting wet strength are of the cationic, water-soluble, polyamide-epichlorohydrin (PAE) resin type. Numerous PAE resins are known to the art. See U.S. Patent 3,332,901 to Keim. One preferred PAE is made by the condensation polymerization of dimethyl glutarate and diethylenetria ine followed by reaction with epichlorohydrin. Details of this polymerization are described in Chan, U.S. Patent 3,887,510 assigned to Borden, Inc.
(March 6, 1974) , describe a process to produce 10-50 mm. diameter x 1-10 mm fibers (I) from a high-pressure polyethylene (PE) solution. The fibers were beaten in water containing a small amount of surfactant to give a pulped mixture. A 50:50 blend of (I) pulp and natural cellulosic pulp was made into a uniform paper with good wet strength. Absorbent wood fluff cellulosic pulp materials bonded with spurted fibrillated polyolefin pulp treated with a wetting agent is disclosed in Espy U.S. Pat. 4,458,042. These products have good absorbency, but they are not readily degradablfe when discarded. 1972: 133.50) describe useful paper products based on polypropylene and polyethylene thermoplastics (with or without wood pulp blends) . Advantages claimed include water resistance, dimensional stability, wet strength, decorative effects and special functional properties. Bogomol & Luchinkina (Bumazh, Prom (1):10-11 (1975) ; Russian) reports that beating of wood pulp increr es the specific surface area (S) and length/diameter (1/d) . The increase of S and 1/d also improves bonding between the acrylic fibers. Hydrolyzed nylon, (FMC British Patent 1,229,806, April 28, 1971) has also been used to improve wet strength. Although olefinic polymers provide superior wet and dry strength via thermal bonding, they are not readily biodegradable and are non-hydrolyzable. Thus their disposal poses a problem. Bohmer (Norsk Skogind, 28(11) :301-2) (November, 1974) discusses the results of a study on the natural decomposition rates of paper versus plastic-based materials. Paper and plastic wastes first degrade photoche ically, followed by relatively slower biological degradation. The presence of wet-strength resins retards the degradation of paper. Cellophane and polyethylene (PE) decompose relatively faster than polystyrene (PS) and polyvinylchloride (PVC) . After 15 months of exposure, the structure of paper and polyethylene may still be intact, but the strength properties will have approached zero. Gottsching described the future of synthetic pulp as bleak based on the resistance to degradation. (Future of Synthetic Paper From Plastic Films, Papier 26(10A) :720-32(Oct., 1972); Ger. ; ABIPC 43:A10360.) The author reviews the cost development of raw materials and synthetic papers, and concludes that, apart from certain special applications, there will be no breakthrough for such synthetic pulp papers within the next 15-20 years. Most conventional wet strength resins rely on chemical bonding, reacting with the paper fiber carboxylate surface to provide dry and wet strength. These bonding mechanisms are not particularly effective when paper akers use Bleached Chemi-Thermal Mechanical Pulp (BCTMP) . Most such mechanical pulps have a reduced number of bonding sites compared to bleached kraft pulps. This is due to the non-reactive lignin sheath on the surface of the BCTMP fiber. The paper producers report that they would like to use more of the less expensive BCTMP fiber, but that they would like to improve the fiber's ability to bond in the sheet. In addition, the rigidity of BCTMP pulp fibers provide limited fiber-to-fiber contact for chemical bonding. The prior art discloses the use of long lasting and temporary cellulosic bonding resins which chemically bond to the cellulosic surface. In contrast, the paper product of this invention is made using a degradable polyhydroxy acid (PHA) resin which uses a thermal plastic bonding mechanism. The PHA resin bonds cellulosic and inorganic substrates independent of the substrates' chemical reactivity. The prior art also discloses useful polyacrylic bonding agents which bond cellulosic and inorganic substrates via thermal plastic bonding. These bonding agents are not completely degradable by microorganisms to by-products of respiration (CO2, H2O, etc.) and are not hydrolyzable. Furthermore, these thermoplastic bonding agents cannot be separated from the cellulosic substrate during conventional repulping conditions. SUMMARY OF INVENTION In accordance with this invention there is provided polymeric resin-bonded cellulosic pulp products that are totally repulpable under conventional repulping conditions. Also, under certain controlled repulping conditions the resin can be retained in the pulp as a reusable resin bonding agent. Alternatively under other conditions and selection of resin properties, the resin can be completely removed from the cellulosic pulp during repulping. Specifically, it has been found that certain degradable polyhydroxy acid (PHA) resins are effective dry strength and wet strength resins for paper. The resins are stable in aqueous solution under paper- making conditions. The PHA polymer has the advantage of being relatively inexpensive and can be provided as 100% solids that have a long shelf life. DETAILED DESCRIPTION OF THE INVENTION - The present invention relates to high wet strength papers and other pulp products, and their preparation. The products of this invention can be in the form of uniform sheets (both hard and tissue) , composite laminates, or shaped articles. By appropriate selection of the resin properties, suitable containers can be made for hot liquids, such as paper coffee cups, and also for mildly basic or acidic materials. Also liquid absorbing hydrophilic batting materials, such as used in disposable diapers, sanitary napkins and medical pads having high absorption capacity, can be made. PHA filaments can also be incorporated into non-woven cellulosic fiber or pulp disposable garments. The compositions of this invention have a wide variety of uses due to the polymeric resin's ability to thermally bond chemically dissimilar surfaces such as BCTMP, bleached L/C kraft, synthetic organic or inorganic fibers and particulates under a wide pH range. A major advantage is that the polymeric resin of this invention provides superior thermal bonding while retaining the capability to repulp, recycle, hydrolyze and biodegrade. The products of this invention comprise cellulosic pulp fibers bonded by certain degradable polyhydroxy acid resins bonding agents. The bonding agent comprises 5-50% by weight of the product. If the pulp fiber and the PHA resins are to be wet blended, it is desirable to use a wetting agent to facilitate blending. A wetting agent is also desirable as a component in products that are used to absorb water, such as towels and diapers. Preferably the wetting agent is an anionic or nonionic wetting agent of less than 10000 M.W. 1 to 12 carbon atoms, or substituted hydrocarbyl containing 1 to 12 carbon atoms; and Z is O, S, NH or PH.. Examples of suitable non-hydroxy acid co-monomers include those capable of condensation polymerization with lactide or lactic acid, i.e., laσtones such as epsilon-caprolactone, beta-propio- lactone, alpha, alpha-dimethyl-beta-propiolactone and dodecanolactone; lactams; other hydroxy acids such as glycolic acid; and a ino acids. For a more complete list see U.S. 4,800,219 at column 9, line 27. The values of p, q, r and s are selected to impart degrees of crystallinity and crystallization rates appropriate to oriented film production. The preferred PHA is polylactic acid, either as a homopolymer or as a copolymer containing over 50%, and preferably over 70%, of lactide units. For certain uses, particularly for food containers, the L form of lactide is preferred since it is naturally present in the human body and in certain foods such as milk. Polyhydroxy acids may be synthesized by polymerization directly from hydroxy acid precursors, or by polymerization of the cyclic monomeric or cyclic dimeric lactone of hydroxy acid precursors. When produced from lactones, choice of cyclic monomeric or cyclic dimeric species as polymerization monomer will depend upon the hydroxy acid type. Polymerization from cyclic lactone is preferred for producing high molecular weight polyhydroxy acids because equilibrium reactions with the intermediate, cyclic dimer and low molecular weight species place practical limits on the molecular weight of polymers produced directly from hydroxy acids. Polyhydroxy acids of this invention have molecular weights at least high enough to provide sufficient viscosity and strength to form sustainable films and fibers from the polymer melt, when such shaped structures are used. Weight of average molecular weights from about 50,000 to about 600,000, and preferably from about 150,000 to about 450,000 are effective in these forms of this invention. If the molecular weight is too high, excessive degradation occurs at the temperatures required to melt process the compositions. Lower molecular weight polymers, including those containing small amounts of unreacted monomers and oligomers, may also be used when the polymer is introduced into the pulp in a particulate form. However, the polymer must be sufficiently polymerized to be substantially non-hydrolized in the paper manufacture, storage and use and it must not soften and stick to the dryer drums. The PHA resins normally will be used alone as bonding resins. However, to enhance certain properties such as wet or dry strength, impact strength or tear strength, for some products it is desirable to blend the PHA with another material such as a PAE, polyolefin, polyvinyl alcohol, starch, formaldehyde polymers and others. If a non-compatible polymer is to be blended with the PHA, a compatabil- izer will be included to produce a microhomogeneous blend. Preferably the PHA content of the bonding resin is at least 50%. The term "degradable", as used here with respect to the polyhydroxy acids, means that the polyhydroxy acid portion of the degradable material is biodegradable and, more importantly, degradable by hydrolysis. The degradation rate is consistent with its intended usage, i.e., the product does not degrade significantly in normal storage and usage, but will degrade in a reasonable time, after discarding. For hydrolysis degradation, slightly acidic or basic conditions may be used advantageously. Rate of hydrolysis degradation is affected by degree of polymer crystallinity and amount of water exposure. By hydrolysis degradation, monomer units can be recovered if desired for reconversion to useful polyhydroxy acid, or can be discarded as an environmentally benign waste material. In papermaking, it is useful to incorporate in the PHA resin paper chemical additives that will be mechanically entrapped in the paper matrix. Such chemical additives include dyes, fluorescent whitening agents, organic and inorganic fillers, electroconduc- tive chemicals, biocides, fungicides, sizing agents, crepe paper-making agents, defoamers, retention aids, drainage aids, cross-linkers, anti-stick release agents, anti-corrosion chemicals, deinking solvents, hydrophilic or oleophobic chemicals and chelating agents. In manufacture of the products of this invention the PHA resin is introduced directly into the pulp in any desired form such as particulate, fibers, spurted fibers, or sheet material. Fibers may be short length or continuous filament and may be fibrillated. Sheet material may be in the form of film, or woven or non-woven sheet material. The resin may be introduced into the pulp by dry mixing or at any stage in the wet processing of the pulp, such as onto the screen or directly into the pulp beater. Introduction into the beater is preferred because of the resultant intimate mixing of the pulp and resin. The paper is then prepared by conventional techniques. If a wetting agent is to be used, it can be introduced onto the dry cellulosic pulp, added during dry blending of the pulp and PHA resin, or during the wet processing steps. To achieve the strength and other desirable properties of the products of this invention it is necessary to heat soften the PLA polymer to bond the cellulosic fiber or to melt the polymer to impregnate and coat the cellulosic pulp fibers. Thus the preparation of the products includes the step of heat treating at a temperature above the polymer softening point. A major advantage of these bonded cellulosic pulp products is that they not only have superior dry and wet strengths, but also they can be repulped and recycled; and the resins are hydrolyzable and biodegradable. Additionally, if the resin is essentially L-polylactide, which is present in many foods such as milk and other dairy products, the products of this invention have high utility as food wrapping material. The composite sheet was cut into a 1" wide by 4" long tensile specimen in such a way that the polylactide fibers were aligned in the direction of tension. A Model 1011 Instron Co. tensile tester in a 50% relative humidity, 73"F conditioning room was used to test 1/4" spans at a crosshead speed 5"/min. Wet strength testing was conducted after allowing the test samples to soak in distilled water for 5 minutes at room temperature. The polylactide filament described in Part A of this example is evaluated as a dry and wet strength resin using the procedure described in Example 1. Results are shown in Table 1. 1 Polylactide sandwiched between 2 BCTMP sheets. Table 1 shows improved wet and dry strengths imparted to these BCTMP composite products containing PLA. EXAMPLE 2 This example illustrates a paper composition containing polylactide film sandwiched between 2 BCTMP papers and its use as a dry and wet strength resin for paper. Polylactide film was inserted between two TAPPI standard BCTMP handsheets and heated at various temperatures in order to melt the polymer on the surface of the BCTMP fiber. The control sheets had no polylactide sandwiched in between and were heat treated at the same temperature as the BCTMP sheets that had the polylactide sheet sandwiched in between. Table 2 shows that BCTMP with polylactide in the middle (33% Polylactide on an Oven Dried pulp basis) has a dry strength which is dependent on the lamination temperature. Realistic laminating temperatures are more in the 100 to 150*C range, however, the polylactide melting characteristics can be adjusted to the paper mills temperature operating range. Dry strength doubled when heat treated to 200"C to melt the PHL. 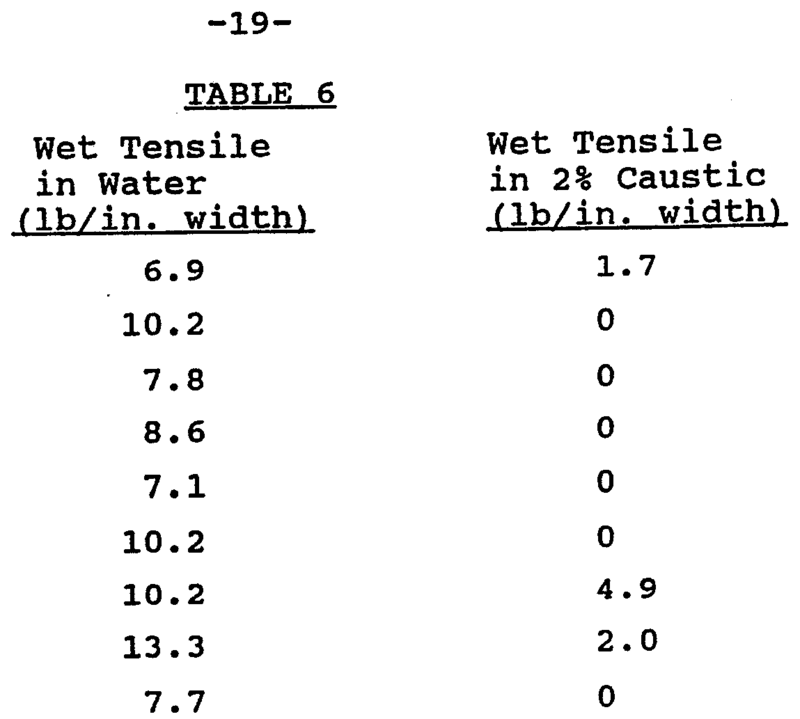 Table 3 shows the wet tensile strength of the control BCTMP sheets increased as the temperature increased indicating that the BCTMP might have had some bonding due its own lignin content which bonds the fibers. At room temperature the polylactide film does not bond to the BCTMP sheets and the tensile strength is due to the strength of the polylactide film. As the temperature is increased the polylactide bonded at 100"C and improved the wet strength. Still further improvements are shown in Fig GRE-2 as the temperature is increased. The BCTMP pulp discolors significantly as temperatures greater than 200 " C . Part C The tensile testing procedure is described in Example 1, Part D.
Table 3. Effect of heat treatment of Polylactide film sandwiched between two BCTMP handsheets on Wet tensile strength. TAPPI standard 205 procedures were used to prepare 3 sets of bleached kraft handsheets containing 0% synthetic fibers, 20 weight percent polylactide filaments and 20% wt % polyethylene pulp (Du Pont Company Pulplus™ QP 3800) . 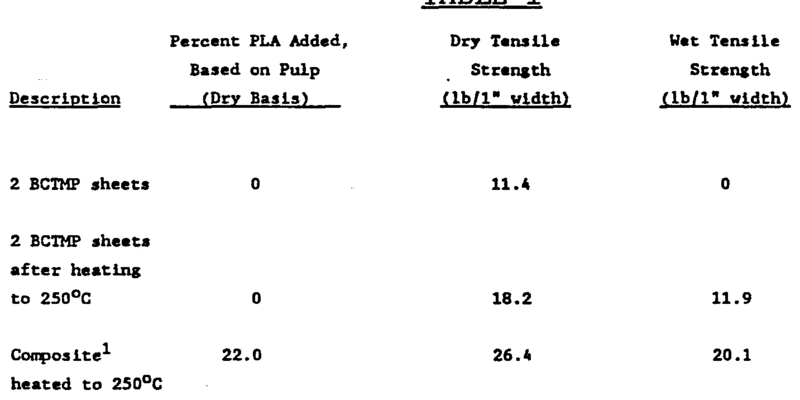 Quarter inch lengths of extruded polylactide filaments (20 wt % oven dried pulp basis) were blended with bleach kraft pulp (70% northern softwood/30% northern hardwood), 345 ml. CSF, and formed into TAPPI standard handsheets. An equivalent amount of Du Pont PulplusTM QP3800™ now called Plexafil™, polyethylene pulp, was used for comparison for the TAPPI handsheet tensile testing. The control was bleached kraft that contained no synthetic fibers. Table 4. Effect on dry strength of heat treatment temperature on PE and PLA-containing bleached kraft composites of 20 wt. % (oven dried pulp basis) of PE and PLA. Table 5. Effect on wet strength of heat treatment temperature on the same PE and PLA-bleached kraft paper composites. Table 4 shows that the dry strength of the PE and PLA-bleached kraft composites decreased as compared to the control. The composite containing polylactide filaments outperformed the polyethylene filament composite. It is hypothesized that the synthetic fibers interfere with hydrogen bonding of the cellulose fibers. The bleached kraft paper composite was heat treated at 100, 150 and 200βC to thermally bond the synthetic fibers to the cellulose. The 100 to 150"C range represents a realistic temperature range for commercial papermaking processes. Table 5 shows that the paper containing polylactide provided better wet strength as compared to the paper containing polyethylene pulp and the control which contained no synthetic fibers. The polylactide has the added advantage of being, repulpable and fully biodegradable. Prior to making the hand sheets containing polylactide, the polylactide filaments had to be dispersed in water with 0.01 wt. % Zonyl® FSO (Du Pont Company) poly oxyethylene perfluoro alkyl ethanol surfactant in order to wet-out and disperse the filaments uniformly in the hand sheet. Dispersants are also used on polyethylene pulps to improve the wetting and dispersion. EXAMPLE 4 This example illustrates a batting product containing cellulosic fibers, a wetting agent and a PHA resin bonding agent. PHA spurted (fibrillated) fibers (bonding resin) are prepared by conventional spurting into water containing 0.01% Zonyl* FSO wetting agent. The PHA spurted fibers containing wetting agent are dry mixed with bleached softwood kraft fluff pulp by pre-mixing and then passing through a blending mill. The blend contains 25% PHA spurted fibers and 75% kraft fluff pulp. This dry blend is then air laid to form a batting, which is heated to 175°C to effect bonding. The resultant batting is used to make diaper lining. These diapers have excellent absorption ability. When discarded in a land fill, this batting material is readily degradable. Also, because of its biodegradability, it can be discarded via toilet flushing into septic systems. EXAMPLE 5 This example shows the ability of PHA bonded paper to be repulped. Polylactide film was laminated between two TAPPI standard BCTMP sheets at 100*C. The laminated composite was cut into 9 one-inch wide tensile specimens and soaked in water at 60*C and tested for tensile strength in 10 minute intervals for a total of 90 minutes. The tensile strength of the composite did not change appreciably during this time. In contrast, soaking composite tensile specimens in 2% sodium hydroxide solution resulted in a dramatic decrease in wet tensile strength and good repulpability of the composite. Tensile strength decrease is a measure to determine degradation and repulpability of the polylactide BCTMP matrix. After 20 minutes soaking time at 60"C the polylactide began to delaminate from the BCTMP hand sheet. After 30 minutes soaking the film stretched before breaking, but after 40 minutes soaking the film fell apart immediately when put under tension. After a 60 minute time frame (more than adequate for most repulping conditions encountered in the paper industry) the laminate had no significant wet strength and was readily repulpable. Laminated composite samples were soaked for 40 minutes in 2% caustic at 60*C and then were put in a Waring blender for 1 minute on high. The polylactide film separated from the BCTMP sheets and some very small film particulates could be seen after blending. After 90*C soaking for 40 minutes in 2% caustic, no film particulates were visible after Waring blender treatment for 1 minute on high. The fact that the polylactide separates 'from the BCTMP. when treated with caustic shows that the PLA fibers could be reused in the paper making operation, which is not possible with other wet strength resins. (v) copolymers of (i)-(iv) with non-hydroxy acid comonomers wherein n is 2, 4 or 5; p, q, r and s are integers, the total of which is from about 350 to 5,000; R' and R" are selected from hydrogen, hydrocarbyl containing 1 to 12 carbon atoms, and substituted hydrocarbyl containing 1 to 12 carbon atoms; and Z is selected from O, S, NH or PH. 2. The product of Claim 1 wherein the polymer contains at least 50% of polylactic acid. 3. The product' of Claim 1 wherein the polymer contains at least 70% of polylactic acid. 4. The products of Claims 2 and 3 wherein the polymer contains at least 50% of polylactic acid with a preponderance of L-lactic units. 5. The product of Claim 1 wherein the polymeric resin contains at least 50% of said polymer. 6. The product of Claims 1-5 comprising 5-50% of the polymeric resin. 7. The product of Claims 1-6 wherein the cellulosic fibers are kraft pulp. 8. The product of Claims 1-6 wherein the cellulosic fibers are BCTMP pulp. 9. The product of Claims 1-8 containing a wetting agent. 10. The product of Claims 1-9 wherein the polymer resin is a blend containing another polymer. 11. The product of Claims 1-10 in the form of sheet material. 12. The product of Claims 1-10 in the form of a food container. 13. The product of Claim 9 in the form of a liquid-absorbing hydrophilic batting material. (v) copolymers of (i)-(iv) with non-hydroxy acid comonomers wherein n is 2, 4 or 5; p, q, r and s are integers, the total of which is from about 350 to 5,000; R' and R" are selected from hydrogen, hydrocarbyl containing 1 to 12 carbon atoms, and substituted hydrocarbyl containing 1 to 12 carbon atoms; and Z is selected from O, S, NH or PH shaping the mixture of fibers and resin; and heating the 5 shaped mixture in the dry state to a temperature above the softening point of the resin. ES2216425T3 (en) 2004-10-16 thermoplastic polyvinyl alcohol fibers and their method of preparation.